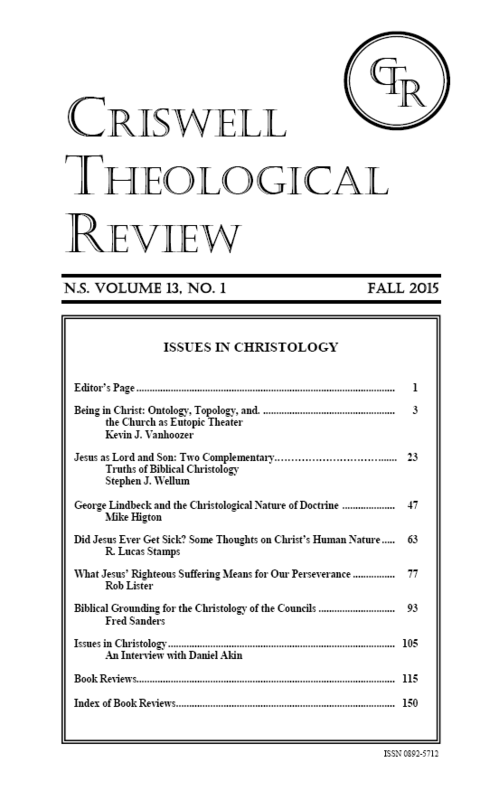 I have a brief article in the Criswell Theological Review‘s Fall 2015 theme issue on christology. The article is “Biblical Grounding for the Christology of the Councils,” CTR 13/1 (Fall 2015) 93-104. The main thing I argue in the article is that the most effective way to teach systematic christology is to follow the conceptual structure of the early ecumenical councils, supporting that structure with biblical evidence. I argue that this way of organizing the material is generally more helpful than working straight from scripture. It’s a little counter-intuitive, at least to a sola scriptura theologian like me (to whom biblicism is not a pejorative word), that I would find myself commending the pattern of the church’s doctrinal tradition rather than a pattern found in scripture itself. In the article I provide some argument for why I make that prudential judgment. The short version is this: the tradition sets forth an explicit divinity-humanity schema, routes christology through soteriology systematically, and traces a maximally long narrative arc from eternity to incarnation as the setting for the works of Christ. We could pretend that these three things are prominent features in scripture’s presentation of Christ, but I just don’t think they are un-overlookable features of the biblical text. They require teasing out, which is what they received in the councils. The second presupposition is that Scripture does not mandate any particular organizational scheme for teaching the truths of christology, so the church and its theologians are not only permitted but even required to shape their teaching as seems best to them. From this it follows that there may be multiple possible and permissible ways to organize the subject matter, and that as long as the material is all present, it is probably not productive to fret about the sequence of the material. In such matters, the Protestant theologians of earlier days had a motto: methodus est arbitraria, “the method is a matter of choice.” The late eighteenth- century theologian J.C.W. Augusti pointed out that “what the old theologians intended by this saying was by no means to give free play to a desultory license, but only to show how the order, sequence and position of the individual parts can be changed, so long as the general rules and determinants of the relationships are maintained.” The decision about how to handle christology is one that must be made carefully, precisely because the format is not determined in advance by Scripture. The third presupposition is that in this case, the church’s tradition is not at odds with Scripture, but serves it well, having produced in the course of its development an organizing schema that has attained the status of a classic. Such a harmonious agreement of Scripture and tradition is possible is an option worth considering to general, but to prove that it is actually the case when it comes to christology is the substance of what will be argued to this entire article. And the rest of the article marches through the first five ecumenical councils, collating scriptural evidence to undergird their doctrinal conclusions, in order to show the benefit of teaching christology this way.